KT&G (President, Baek Bok In) will hold a campaign to celebrate the 100th anniversary of the March 1 Independence Movement and the Provisional Government Establishment of the Republic of Korea. The slogan and commemorative CI release and related exhibitions will continue until the end of March. The campaign slogan is 'Korea, continues the great imagination'. It will reveal that the great imagination of our ancestors for independence has become the Republic of Korea today, and KT&G will join the great imagination for the new 100 years. KT&G made a commemorative CI with Rose of Sharon, the national flower of Korea, applied to the corporate logo. It combined KT&G's "Imagination Seed" with Artist Lee Don Ah’s “Rose of Sharon” to shape the flower blooming from the seed. 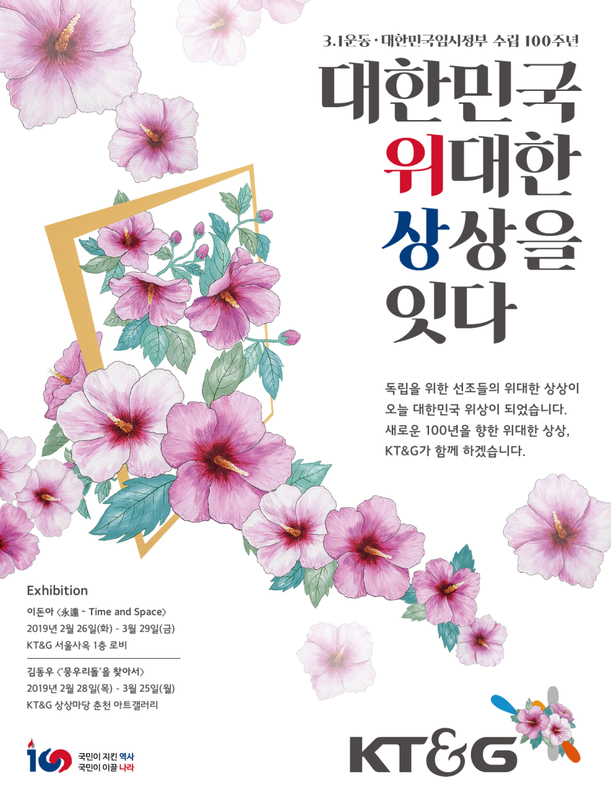 KT&G Seoul headquarter and its multi-cultural space 'Sangsang Madang' will hold photo exhibitions featuring Rose of Sharon paintings and footsteps of overseas independence movements. In the first floor lobby of the KT&G Seoul headquarter, artist Lee Don Ah’s painting exhibition will be held until March 29. Here, they will show a painting titled "Eternity" of 4.5 meters in width and 1.8 meters in height, in which the flowers of Rose of Sharon are brightly arranged. On the outside of the building, a large banner with Rose of Sharon, memorial CI, and campaign slogan is installed. In Sangsang madang Chuncheon, a photo exhibition of artist Kim Dong Woo titled will be held until March 25th. Photos of traces of foreign independence movements and independence activists will be exhibited here. On the exterior Media Canvas of Sangsang Madang Hongdae, media arts images related to Rose of Sharon, co-produced by Lee Don Ah and Lee Ki Taek will be screened. Inside 'Design Square', there will be discount events for 100 products such as 'Yoon Dongju Poem Perfume' and 100 movie invitation tickets will be distributed. KT&G officials said, "On the occasion of the 100th anniversary of the March 1 Independence Movement and the Provisional Government Establishment, We held a campaign to celebrate the noble spirit of the ancestors who achieved independence." "We will remember the history of independence and prepare for the future through these exhibitions. ▶KT&G (President Baek Bok-in) will hold a campaign to commemorate the 100th anniversary of the March 1 Independence Movement and the Establishment of the Provisional Government of the Republic of Korea. The slogan, commemorative CI will be released, and art exhibitions will continue until the end of March. The photo is a campaign commemorative CI image. ▶KT&G (CEO, Baek Bok In) will hold a campaign to celebrate the 100th anniversary of the March 1. Independence Movement and the Establishment of Provisional Government of the Republic of Korea. The slogan and commemorative CI releases, and exhibition of works will continue until the end of March. 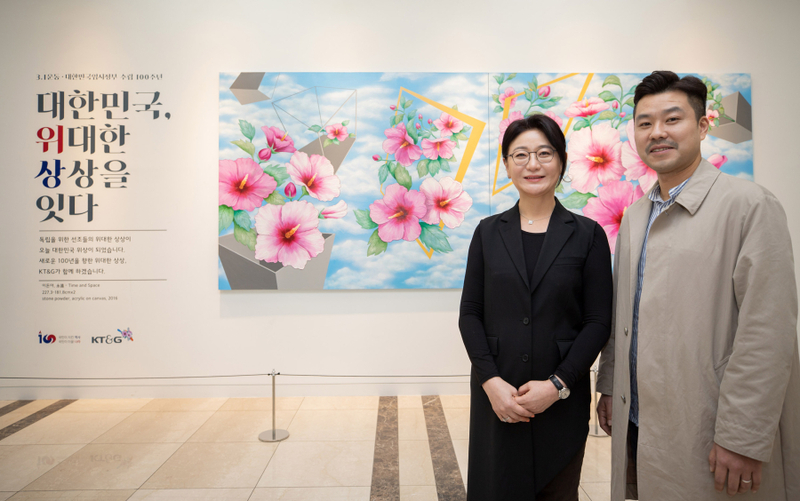 The photo is a painting exhibition of Rose of Sharon (Work title: Eternity), which was held on the first floor of KT&G Seoul Head Office, attended by Lee Dong-ah (left) and Kim Dong-woo (right). ▶ KT&G (CEO, Baek Bok In) will hold a campaign to celebrate the 100th anniversary of the March 1. Independence Movement and the Establishment of Provisional Government of the Republic of Korea. The slogan and commemorative CI releases, and exhibition of works will continue until the end of March. 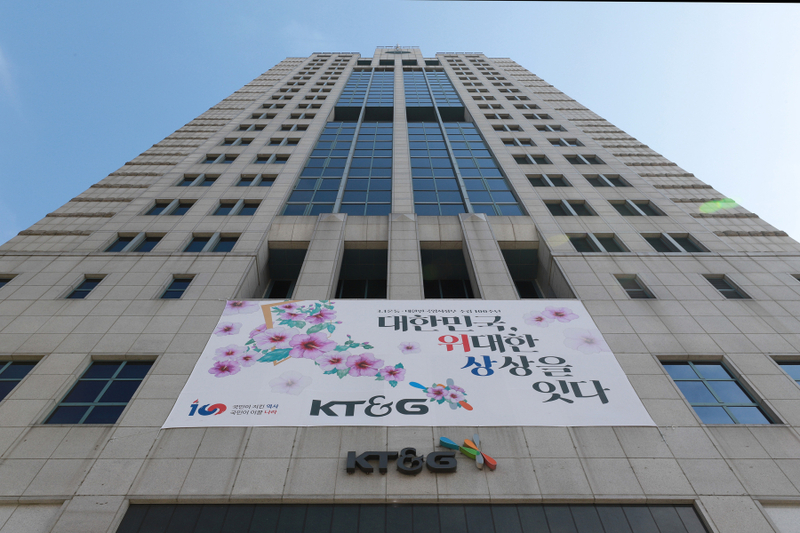 The photo shows the large banner of the campaign installed on the outside wall of KT&G Seoul head office.